Arguably, the mainstream sector has been even more fiercely contested than the high-end and bleeding edge sectors. After the slightly rushed release of Radeon X700 XT, ATI have been on the back foot in the mainstream PCI-Express playground, despite having a very promising product in the pipelines. Today, we move our focus back to AGP, which has got rather interesting since NVIDIA implied that they had every intention to bring NV43 (the GPU behind the GeForce 6600 series' cloak) back to AGP from its native PCI-Express interface. 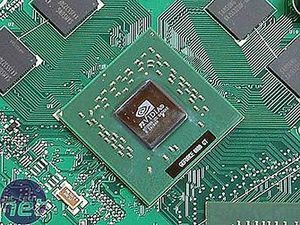 We took a look at the technical details behind the GeForce 6600 series back in August when it was paper released, and then we investigated the GeForce 6600GT on PCI-Express a little further at the start of September. The technical details of the GPU remain the same, so we recommend reading through the linked articles to get an idea of the internal structure of the NV43 graphics processor. 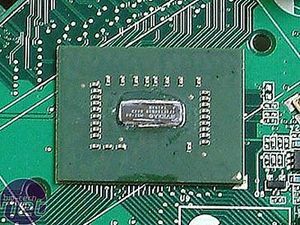 When we had a look at the GeForce 6600GT on PCI-Express, we also had a look at the PCIe version of the GeForce 6800GT, which uses a HSI bridge chip located on the same SKU as the graphics processor - this is known as the NV45; however, it is basically an NV40 with the HSI bridge chip enclosed on the same flip chip. Things are a little different with the GeForce 6600 series, as they are moving from a native PCI-Express GPU back to the slower AGP interface. As you can see, the HSI bridge chip is not located on-chip and its location has meant that both the memory and the GPU have been moved with a slight anti-clockwise rotation too. We would put this down to the fact that the AGP traces need to be of a certain length, as do the traces from the HSI bridge chip to the GPU. Seeing as the AGP bus is only capable of directly supplying a mere 46W to the video card, there is a requirement for an additional power connector on the PCB. This takes the form of a standard four-pin molex connector, as one is accustomed to using for powering their hard drives and CD/DVD drives with. 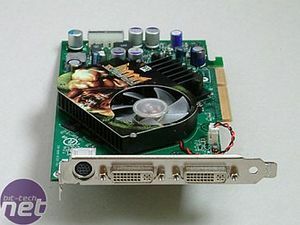 Many power supplies have dedicated power lines for connecting video cards with a 'clean' power line, but we expect board partners to include a power splitter of some description. We all remember that the GeForce 6600GT on PCI-Express was touted as the Doom 3 GPU; well, the heatsink on our reference design AGP board has a Doom 3 branded heatsink fan assembly. 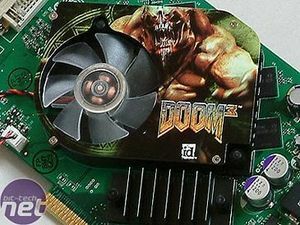 It follows the same design as the PCIe version, but with substituted Doom 3 artwork. It would appear that NVIDIA are really pushing this board as the best value video card for playing Doom 3 - we will have to see how it holds up a little later on. It's also worth noting that there is a separate heatsink that cools the HSI bridge chip - the bridge chip doesn't give off a great deal of heat, so this heatsink remains a passive sink for the time being, which helps to keep the overall noise of this video card down to the bare minimum. The heatsink is quiet and efficient, while also being a single slot design. The reference board features dual DVI ports, which are powered by dual 400MHz RAMDACs - this is good news for the TFT lovers out there. 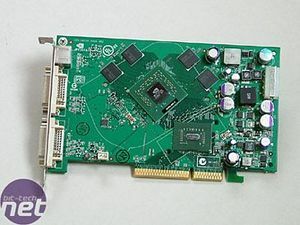 Many board partners may or may not choose to follow this design - the reference PCI-Express 6600GT had a DVI and VGA output configuration, while some board partners opted for a dual DVI output on their retail boards. At this time, we expect board partners to follow a similar pattern what has been seen on their PCI-Express 6600 series' video cards.